The L.A. Weekly heroically champions books that, for whatever reason, did not receive the attention they deserved. Hence, the term "undernourished." It's a knock on the culture that couldn't sustain them, not the books themselves. They could just as easily be called the Blame it on the Britney Awards. 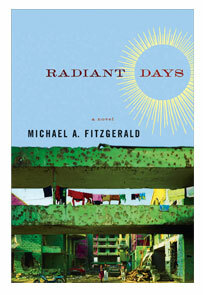 I chose Michael A. FitzGerald's Radiant Days, a wolf-in-sheep's-clothing of a novel that knocked my socks off. True story: Radiant Days had been sitting on my shelf for weeks until I read an interview with its author in New West. FitzGerald struck me as such an earnest, intelligent guy that I felt compelled to read the book, and when I did, it kind of blew me away. During the climax of the novel, I actually shouted, "Oh no!" like some kind of 19th century hayseed at a nickleodeon. It was a great feeling to be moved by a book like that.